Andreasens Green produces a diverse range of native and exotic species in a wide range of pots sizes- tubestock through to super advanced and ex ground palms. Andreasens Green has been supplying plant material to the Landscape industry for 30 years. 150 acres of combined nurseries throughout NSW and QLD, provides us with diverse climatic conditions which enables us to grow a wide range of species. Our Lansvale nursery site is the home to our tubestock production centre. 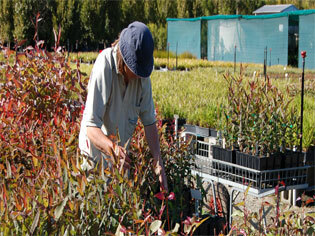 We offer a “Provenance Pre-Grow” service for revegetation projects in addition to our general production of native trees, shrubs and grasses. Andreasens Green is very proud of our Advanced Tree Production. 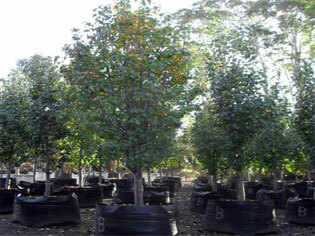 We are a strong advocate for Natspec – Specifying Trees. We have been utilising this specification since its inception and continue to support it. We have recently compiled “Our guide to Natspec- specifying trees” with the aim of training our staff and assisting in the understanding of the specification on a practical level to our customers and the wider landscape industry. Our in house Arborist has been conducting field days and coordinating demonstrations to assist further in the education and understanding of Natspec principles. 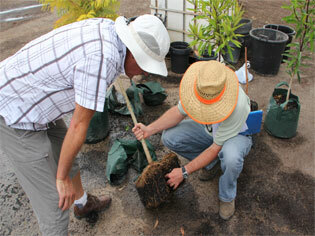 Andreasens Green has secured the selling rights for ex ground Livistona australis. 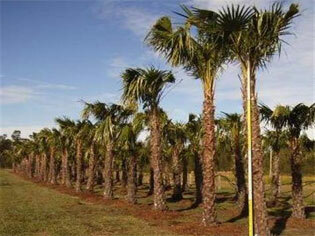 All palms have NSW National Parks and QLD DPI certification and have been hardened off to full sun and wind conditions. We have a wide range of sizes available, from 2-6m of clear trunk.